Restrict Content Pro is a simple, yet powerful membership solution for WordPress. The Restrict Content Pro Member Discounts extension for EDD allows you to create discounts based on Restrict Content Pro membership levels. These discounts are unrelated to the product itself, or any other discount codes and options. These discounts are specifically connected to Membership Levels in Restrict Content Pro. If you have a certain membership level you automatically get whatever discount is set for that membership level. This document assumes you have Restrict Content Pro installed and know how to use it. Full documentation for Restrict Content Pro can be found here. 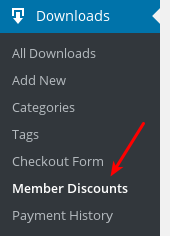 Immediately after installing the Member Discount extension you will find a Downloads → Member Discounts menu option in the WordPress admin. Then in the top of the page there's an Add New button. The options for creating a new discount are quite simple. You provide a Title, which will be displayed on the checkout form, choose a Subscription level, and then a percentage off the total cost. Once a discount is created for a given membership level that discount is automatically applied to any sale for anyone holding that membership level. The customer doesn't need to do anything to make the discount take effect. Here's a screenshot of a checkout page for a Platinum Member with a 50% discount for all Platinum Members. Customers who are not members, or are members with no discount set will never see an indication that discounts exist for any membership level. You can prevent single products and/or whole product categories from being discounted. To do that, simply edit the product or product category in question, enable the option to exclude the product or category from discounts. To exclude a single product, edit the product, check the option to Exclude from RCP Member Discounts in the Download Settings panel, and save the product. To exclude an entire category of products, go to Downloads > Categories, edit the category you want to exclude, select the Exclude from RCP Member Discounts option, and save the category. Note to shop owners: if you are testing this extension on your site to see how it works, it's important to understand how it works. 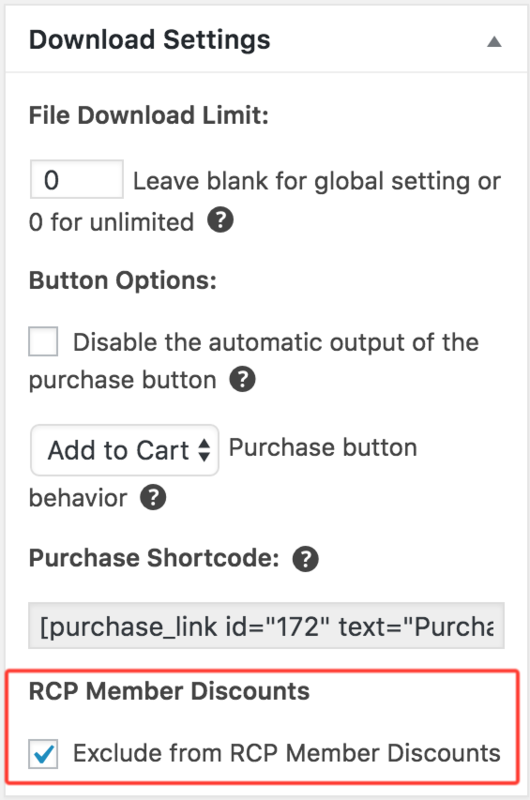 The extension checks a member's subscription status when adding items to the cart, not on every page load. If you are adding items to the cart to see the discount, and then switching to another window to expire the member, you will still see the discount in the cart if you refresh the screen. To accurately test, you need to remove the items from the cart and add them back. You will see that the discounts are not applied.